Here are the best cafes, restaurants and bars in London for warming up on melted milk, white and dark chocolate. 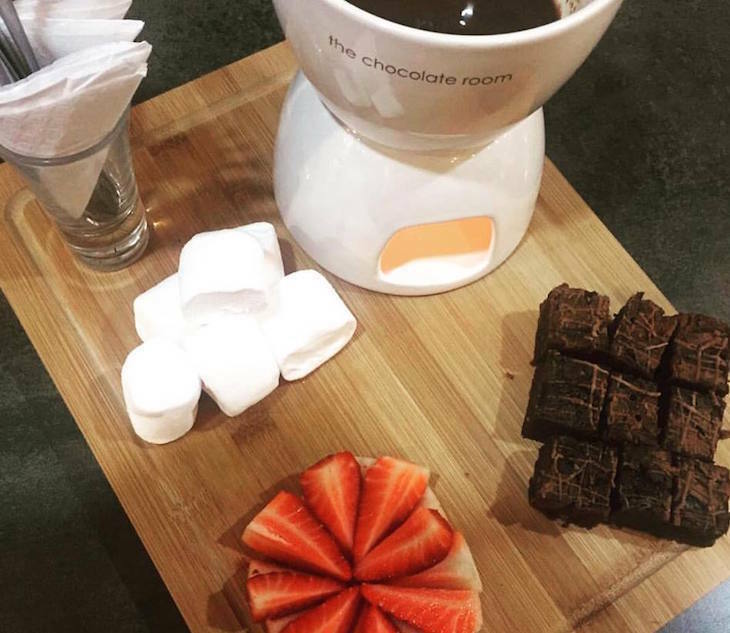 Dip marshmallows and dunk fruit into chocolate fondue with wild abandon this winter, then wash it down with one of London's best hot chocolates. This place is a chocolate lover's dream — a whole shop and cafe dedicated to the good stuff. 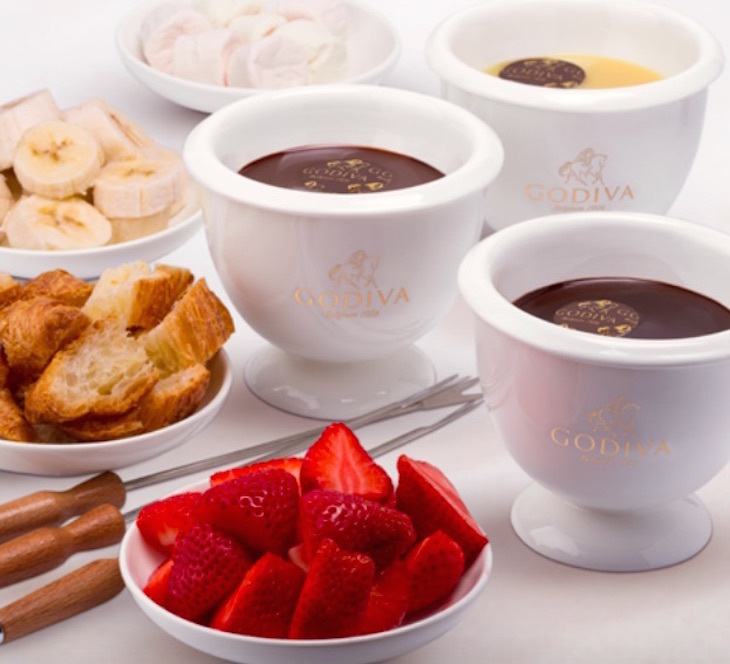 If you're after chocolate in its melted form, go for the fondue, designed to feed two people. 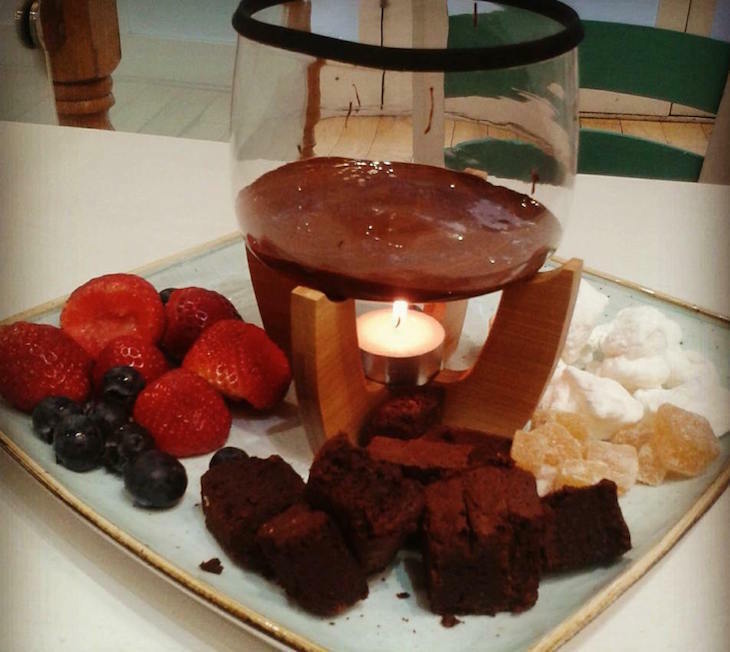 It's served with strawberries, chocolate brownie and marshmallows for dipping, placed above a tealight to keep it molten while you munch. Everything served and sold here (including those marshmallows) is vegetarian — and lots of it is vegan too. Jaz and Jul's hot chocolate also made our list of the best hot chocolates in London. Here's a closer look at that fondue. Try not to lick your screen, yeah? If it's luxury you're after, head to Harrods and get dipping in the melted Godiva ganache. Choose from milk. dark or white chocolate, and dip croissant pieces, strawberries and marshmallows, all in a somewhat decadent setting. If there are a few of you (or you're having a really tough day) ramp it up a notch and order a chocolate fountain — again, there's the choice of milk, white or dark chocolate. Cafe Godiva's Hot Chocolixir features in our list of the best hot chocolates in London too. The food at Peruvian restaurant Coya has Spanish, Japanese and Chinese influences too, but the 'Chocolate Fundido' is pure Peru, made with melted Ilanka chocolate fondant (Ilanka is a 63% dark chocolate made by Valrhona, offering a rich, but not overpowering, fondue). It's served with praline, and banana ice cream. The menu varies between both London branches but at time of writing, chocolate fondue is available at both. More bar than chocolate house, Suburb SW11 isn't somewhere you'd expect to find fondue — let alone both chocolate and cheese versions. 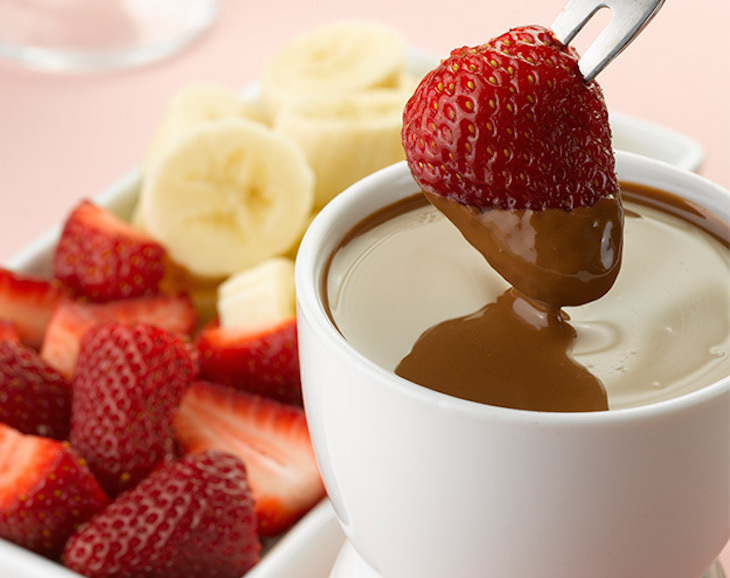 The Belgian chocolate fondue serves two, and is served with marshmallows and fresh fruit. You've probably walked past this Turkish coffee and chocolate shop on Piccadilly many times, and written it off as just another tourist-baiting cafe. Well it's so much more. Head inside for pastries, Turkish sweets... and of course, milk chocolate fondue served up with fresh fruit. Alright, it's not strictly chocolate, but it's just as good. If you can look beyond Damien Hirst's formaldehyde cow, this restaurant has some pretty sweet offerings. 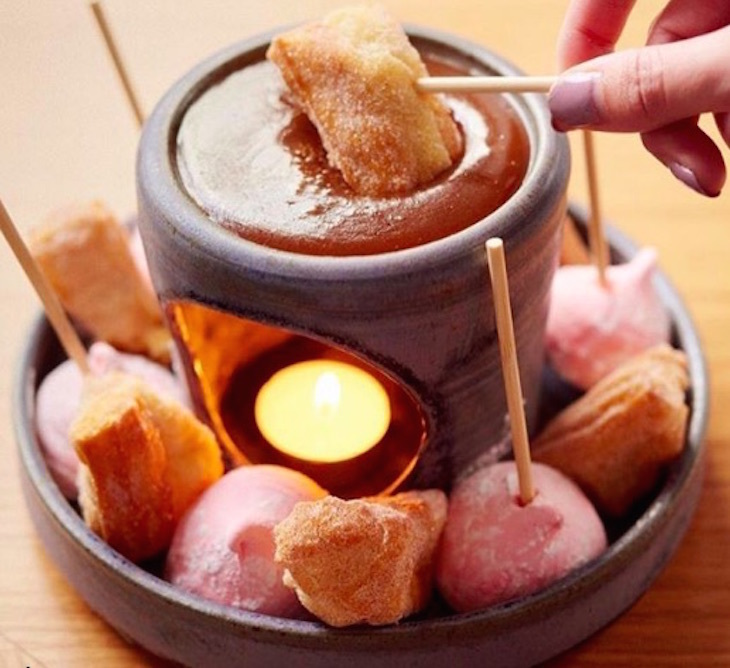 The salted caramel fondue is served with marshmallows and doughnuts, and is intended for 3-4 people to share... but no-one's forcing you. If you're a fan of melty stuff (who isn't, right? ), eat your way through London's best cheese raclettes this winter too.